I always sort of liked revamps of old LEGO sets built with modern techniques. If they are built nicely they have the nostalgia and the aesthetic look at the same time. 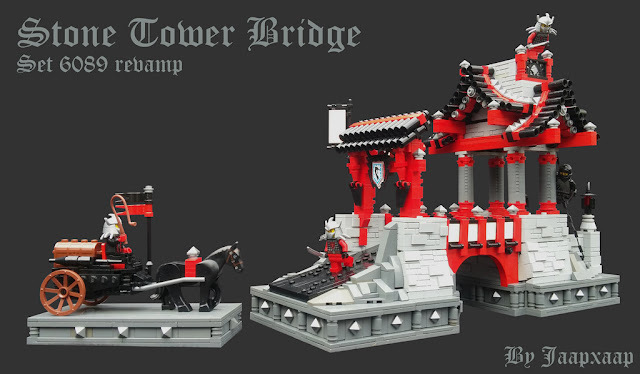 LEGO fan and flickr.com user jaapxaap did a really great job on his latest work, a revamp of the Stone Tower Bridge (6089) castle set. According to the description this MOC was built for The Tourney 2017 in MOCpages. The color-combination and the texturing of the structures was done nicely. I also liked how the roofs were built using small connector tube pieces. The original version had very large slope pieces to form the cliff but the jaapxaap was able to do it building a wall with an angle and that also look interesting. Using Shredders helmet and shoulder spikes to form purist custom figures and using nexo power tile (Ice dragon power tile was used. Maybe another tile with red color would fit better.) as a symbol on the gate are other interesting ideas used in this MOC.